The present Church of All Saints in Bloxwich (SJ 997018) was built c.1791-4 with major alterations and extensions made in 1875-7, although it is possible that an earlier church once existed on the site. The church was originally dedicated to St. Thomas of Canterbury but was rededicated after the alterations in 1875. An interesting piece of archaeology which lends credence to the supposition of a Me dieval predecessor to All Saints' lies in the churchyard just south of the south porch (SJ 9975 0189). 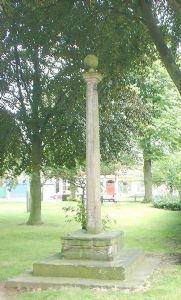 A churchyard cross of red sandstone, the stepped base, socket stone and shaft of which is Medieval in date, surmounted by a knop and ball finial which was added in the early-20th century. The first step measures 2.33 metres square, the second 1.64 metres square, both being 0.23 metres in height. The socket stone measures 0.97 metres square and is 0.42 metres high, from which the shaft of the cross rises, its corners chamfered to a tapering octagon, the full height of the cross being some 3 metres. The cross itself is a Grade II Listed Building, also a Scheduled Ancient Monument. Documentary evidence suggests that the church was founded as a Chapel-of-Ease in the diocese of Walsall by Margaret, widow of Sir Roger Hillary of Bescot sometime in the early-15th century, as the inhabitants were granted a licence to worship here for the first time in 1413. To fulfil the need for a 'Mission Room' at Pinfold, Old Lane Mission was built in 1904. The engraved Victorian foundation stone is clearly visible to this day. There has been worship at the church since it opened with some wartime disruption. It has also been used by Brownie and Guides groups at various times. In 1991, the building was licensed as a District Church when the Bloxwich Team Ministry was established and it became St. James Church.